AIR FORCE ACADEMY, Colo. — Fisher DeBerry wants to clear the air: His triple-option Air Force teams were very much passing oriented. DeBerry loves that jest, and used it all the time whenever his Falcons followers complained the team didn’t throw enough. The triple option has been part of the DNA for Air Force, Navy and Army for decades because it helps level the playing field. It’s hard to defend and doesn’t require mammoth offensive linemen. At its core, the system runs well with a quarterback who has plenty of moxie — quick decision making, too — and a fullback with a nose for getting through a tiny crease. Expect plenty of triple-option play when Army (8-3) faces Navy (6-5) on Saturday with the Commander in Chief’s Trophy on the line. A quick note on the triple option: While the quarterback is obviously the headliner, the fullback actually plays a big role. The fullback dive keeps defenses honest. The third option is always to give the ball to the tailback. It’s a difficult system for an opposing defense to decode in a short amount of time. DeBerry said he heard from plenty of opposing coaches who dedicated time to stopping the option in the preseason, just to squeeze in some early work. 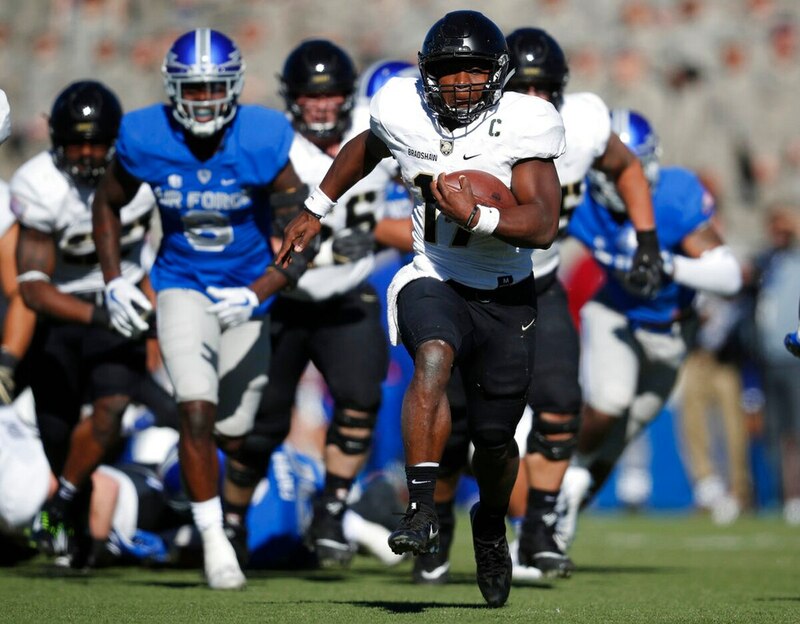 The service academies are typically among the top rushing schools in the country. This season, Army leads the way at 368.1 yards per game, followed by Navy (347.5). After Arizona in third come Air Force and Georgia Tech (each averages 307.4). That’s worth noting since former Navy coach Paul Johnson brought the scheme to the Yellow Jackets. “It gives us a chance to compete,” Navy coach Ken Niumatalolo said. Before taking over at Army, Monken honed his strategy while coaching at Georgia Southern. His signature win while there came in 2013, his final season before leaving for West Point, and against SEC power Florida at the Swamp. Monken called three passing plays, with the last one nearly intercepted. That was it. Georgia Southern won without completing a pass and he hasn’t forgotten. Monken keeps a football from that game as a constant reminder. Back in DeBerry’s day, the high-octane passing game was becoming the rage, especially with the late LaVell Edwards and his BYU teams putting up head-spinning numbers. It was hard not to be enamored with that system. It was also hard to draw huge, pass-blocking offensive linemen to Air Force. That’s due to their military requirements in which they must pass a physical fitness test each semester. In addition, a body-fat measurement must be met for graduation. Earlier this season, the Falcons (5-7) had the ball for nearly 42 minutes in a 45-28 win over Colorado State, whose offense had it for just 18. “They did whatever they wanted,” Rams coach Mike Bobo said. Not the first time that’s been uttered by an opponent. The Black Knights actually abandoned their signature system under Todd Berry from 2000-03 in favor of a more pro-style formation. It backfired as Army went 5-35 under Berry. So the team returned to the triple option, which has gone by a variety of names over the years. Other variations include the flexbone or the wishbone. Air Force calls its particular scheme the zone running game. These days, the read option remains exceedingly popular. By any description, DeBerry relied on it heavily at Air Force as he went 169-109-1 over his 23-year career as head coach. He went 35-11 against the Black Knights and Midshipmen. Those days, he received calls all the time asking him to give clinics on the ins and outs of the option. He still gets a few. AP Sports Writers John Kekis in West Point, New York, and David Ginsburg in Annapolis, Maryland, contributed to this report.